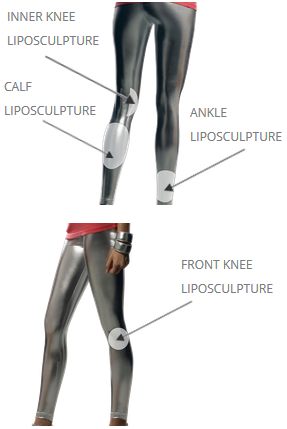 Liposculpture of the knee/calf/ankle region is much less frequently requested compared to liposuction of the thighs and abdomen. Family genetics is commonly responsible for the unsightly distribution of fat in these locations. Unfortunately, diet and exercise usually do not improve these regions. American culture has even coined a slang phrase for fatty accumulation in the calf and ankle region – referring to it as “cankles”. Cankles refers to the lack of narrowing in the ankle region – where there seems to be no defined end of the calf area as well as no defined beginning of the ankle area. This is considered unattractive and very difficult to hide, especially in our southern California climate. Look at your lower legs from the front, back and sides. 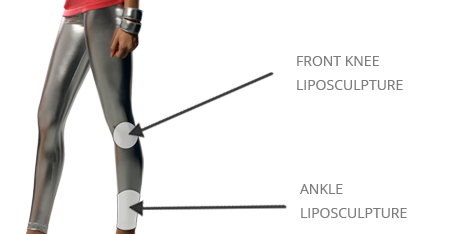 If you lack the normal narrowing and tapering that most people have in the ankle region – then you may be candidate for liposculpture of the calves and ankles. Some patients also have localized accumulations of fat in the inner knee area or around the knee or knee cap. Another way to test these three areas is to lie down in bed and pinch the area of concern. This is referred to as the “pinch test”. If you can feel an accumulation of fat (not just skin and muscle), then you may be a candidate for liposculpture of these areas. Some serious medical conditions may also cause swelling (edema) of the ankle region. This would also obviously affect the cosmetic appearance of the ankles. Evaluation of the ankle area by your primary care physician (internist) is recommended in some cases of “fat ankle” complaints. Dr. Hayduke prefers to perform this procedure in the office under local anesthesia. Elastic garments are worn over the legs and absorbent pads are changed twice per day for two days. Patents are encouraged to walk immediately to encourage drainage and to decrease overall swelling. Compression garments are worn for one week.